I recently came across research from AWeber that found 68% of small businesses plan on increasing their marketing budget in 2013, and a full 97% plan on at least maintaining their current level of marketing spending. That’s a very solid majority of small businesses that are putting more money into their marketing efforts. He adds, “Plus, 47% said they felt the economy had changed positively last year. Looking ahead, when marketers are more upbeat, and seeing the value and returns from channels like email, they’re more confident and, in turn, more willing to invest in effective channels.” (Hunter Boyle will be speaking in an industry perspective session – “Breathing Life (and ROI) Back Into Your Email Marketing” – at MarketingSherpa Email Summit 2013 in Las Vegas). The AWeber research got me thinking. At MarketingSherpa, our usual goal is to provide examples and ideas marketers of any size company might be able to find “transferable principles” that can help ease their marketing pain points, or shed light on potential marketing opportunities. Since small businesses are reporting an increase in the marketing budget, this MarketingSherpa blog post (and part two, which will be published on the MarketingSherpa blog tomorrow) focuses squarely on small- and mid-sized company marketers and feature tips and tactics geared for the SMB marketer. To gain some insight into where SMB marketers should focus in 2013, I reached out to industry experts in the SMB sector. For today’s post, here is Rick Jensen, Senior Vice President, Chief Sales and Marketing Officer, Constant Contact, on SMB marketing in 2013. MarketingSherpa: What marketing channels should be the focus of SMB marketers in 2013? Why should they focus on these channels? Rick Jensen: Money is always a critical issue for SMBs, but time is also a key resource issue. Email marketing has long served as a valuable tool because it’s both a cost-effective and efficient way to engage with customers and prospects, and that won’t change any time soon. Email is projected to continue to grow in 2013, and will remain the preferred consumer marketing channel because people have control over it. It’s nonintrusive. But it’s more important than ever to be smart about email marketing, because consumers have become extremely discerning about what they allow in their inbox. If email looks amateurish, regularly contains content that isn’t of interest to the recipient, or is sent on a haphazard schedule, consumers will opt out and never return. And, while email marketing should be a core component to any marketing strategy in 2013, the key to maximizing its success will be integrating with other channels—like social media, events, mobile—to achieve real engagement with customers. RJ: I wouldn’t say that any one channel is more valuable to one group over the other, but I do think that there are some areas in which small businesses have a distinct advantage over their enterprise counterparts—social media in particular. Most small business owners have an almost innate sense of what it takes to engage effectively with their customers. In 2013, I expect small businesses will approach social media marketing as a business-critical daily activity. And with the proliferation of social media tools, they’ll really master how to measure it. RJ: It’s not surprising, really, but with millions of Americans now shopping by browsing hundreds of directories, websites and mobile apps that provide local business info, even the smallest small business will have to mobile-optimize and enrich their online presence because a key for success in 2013 will be getting found. That means small businesses need a plan of attack for leveraging mobile search, distributing their information across the most popular apps, and mobile-optimizing their websites. MS: Do you have any examples of what SMB marketers are planning in 2013, and where their marketing dollars and focus are going? RJ: Eighty-two percent of small business owners have said their main source of new business comes from referrals, so it’s no surprise they’re taking a hard look at technologies that boost social visibility and feed the referral engine. We recently asked our customers which tools they find effective at both attracting new, and engaging existing, customers. Sixty percent said social media, 52% said an event management tool, and 50% said email marketing, so we expect these channels to be a focus. RJ: To succeed, small business owners have the difficult task of keeping pace with a rapidly evolving technology landscape. They’re definitely up to the challenge, but a good piece of advice would be to look at all of these tools through an engagement marketing lens to ensure that they’re making the best choice for their business. 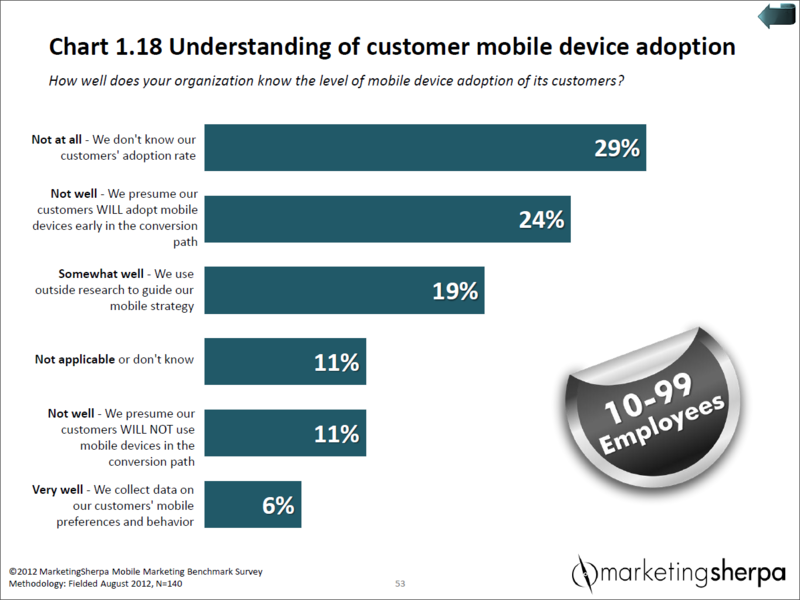 As you can see, companies with 10-99 employees report just not knowing how active their customers are in the mobile channel with only 6% actually tracking customer’s behavior and preferences. For companies with 10 or fewer employees, the number of marketers reporting “not at all” to the question jumps to 39%. So, even though a majority of SMB marketers are increasing the budget in 2013, there is still work to be done to fully take advantage of marketing channels that can be very effective for SMB marketing. Watch for part two of this blog post Friday on the MarketingSherpa blog with more insight from industry experts. 1) Be easy to find online and off from any method and device your potential customers are using – which as always means business directories, especially local, and mobile which is growing among demographics that do not even have computer access as well as among those who do. 2) Do not discount the basics. Building a list and continually improving your email marketing skills needs to be your #1 priority. You MUST choose one of the best email marketing solutions that has high deliverability rates or your emails will not arrive. It is NOT just about growing your list; you must also test compelling subject lines to increase your open rates and invest time in writing messages that generate action. 3) You must make it easy for people to refer you using social media, email, and in print. Make sure your existing customers can easily spread the word for you and ask for those referrals. I know it feels funny at first, but if you don’t ask most will not act. MarketingSherpa, MarketingExperiments, and the Constant Contact blog are all excellent resources for skill development and knowing what to focus on. I’m writing this comment to encourage anyone reading it to make them a regular part of your efforts.